The Netherlands has 12 provinces but the powers-that-be in government want to reduce that to five in order to cut out red tape and boost efficiency. That’s the theory. In practice, none of the provinces like the idea. Drenthe is a mainly rural province, with some industry around Assen and Emmen. It is also home to 53 of the Netherlands 54 hunebedden, or dolmens – megalithic tombs. The newest province, created largely on post WWII land reclaimed from the sea. It’s flat and full of farms. Flevoland has the highest unemployment rate in the country. Fryslân, to give the province its name in the local language, is the biggest Dutch province if you include water as well as land. Frisians who move away – and there is no university in Friesland – are ferociously proud of their roots. Gelderland may be one province but its folk divide it into three areas: the Betuwe known for growing fruit, the Veluwe with its national park and Achterhoek – literally back corner, which stretches to Germany. As far as Amsterdammers are concerned, people from the Achterhoek are stereotypical country bumpkins. Groningen is largely rural – with huge empty expanses of black earth – but has large natural gas reserves in Slochteren. Extracting this gas is causing parts of the province to sink. Beerta is the only Dutch local authority area to have had a communist mayor. Nearly all of Noord-Brabant is above sea level, which will probably be handy in years to come. As a province, it is big on farming, especially mega pig farms. Nor should we forget Eindhoven, home to Philips, and Kaatsheuvel, home to the Efteling ,the biggest theme park in the Benelux. Amsterdam is the national capital, so Haarlem gets the province, although it stretches right up to Den Helder and has sneaked hold of one Wadden island – Texel. 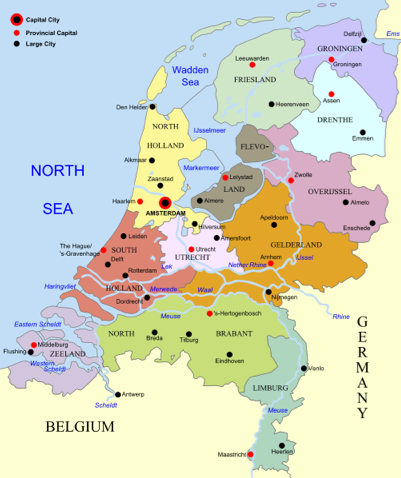 The one province everyone forgets, Overijssel means lands across the river Ijssel, and it stretches from the German border to the former island (and fundamentalist Christian hotbed) of Urk. The smallest and most central of the provinces, Utrecht is also home to the Utrechtse Heuvelrug, or hill ridge, former healthland now largely covered with pine plantations. The most western province, made up of a string of islands and largely below sea level, Zeeland has the lowest jobless rate in the country. It is a hugely popular destination for tourists, particularly from Germany. Zuid-Holland is one of the most densely populated and industrialised areas in the world, thanks to the industrial sprawl of Rotterdam and its port. The southern part of the province is made up of a number of islands, including the strangely named Goeree-Overflakkee. This entry was posted in Uncategorized on March 24, 2013 by europeansinthenetherlands.